The traditional and somewhat regressive notion of population-based cancer registries as providing a mainly retrospective view of the rates and patterns in cancer incidence and prevalence has tended to limit health policy conceptions of how to use registries to improve ways to tackle cancer and its impacts. Policy makers tend to see cancer as inordinately expensive, hardwired into costly research, treatment and care. And while it’s true that the cancer burden is a costly one, cancer registries have a crucial proactive role to play in lightening it, in part by enhancing the effectiveness of a wide range of interventions on a variety of fronts. This is much better appreciated nowadays in cancer treatment research and advocacy, particularly so in low-income countries, such as in Africa, where the role of cancer registries is increasingly appreciated in boosting health promotion. But the message needs amplifying among wider audiences, and the wide-ranging actual and potential use of cancer registries needs greater emphasis. This was the theme of a symposium at the recent 17th World Congress on Tobacco or Health. The roundtable stressed the cutting edge role of cancer registries in saving lives and not just in tracking disease incidence and mortality. Its aim was to show how varied the uses of registry data are in various contexts. Another message the workshop put out that policy makers need to hear is that running cancer registries is not a money drain. The idea that they are comes up now and then, supported for instance by the claim that cancer registries have a limited role in cancer control, and that computerised cancer registration is becoming vastly more complex and therefore vastly more expensive (Thomas, Am J Public Health, 2002 July). The option envisaged is of a slimmed down role for cancer registries using data more selectively. But this would truncate the actual and potential scope for registry data to be used more effectively and dynamically. The argument for operating expansive, centralised cancer registries is that, according to one study, those “that receive high-quality data from reporting sources… and electronic data submissions, and those that collect and report on a large volume of cases had significantly lower cost per case.” (Tangka et al, 2016 ). There seems to be scant evidence that the development and use of computerised software to process registry data represents a burgeoning financial burden. On the contrary, upgrading the technological capacity to improve registry data processing makes it easier to handle greater amounts of information in more manifold ways, and this adds to the overall cost efficiency of registries. Health care systems are under continual pressure to cut costs and perform with more austere budgeting. And cancer registries are easily susceptible to funding pressures – not least if they are conceived within narrow parameters. But as monumental archives of our societies’ long efforts to control cancer, they are simple and effective means for plotting our way forward. The Finnish example is instructive. 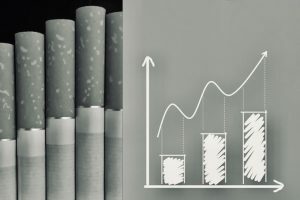 The pioneering use of registry data was instrumental in linking the over 70% smoking rate in men to severe lung cancer prevalence in the 1970s. This led to measures that eventually cut smoking and lung cancer in men dramatically, and by 2017 some 13% of men over the age of 20 were daily smokers. Registry data is central to on-going efforts aimed at ending the use of tobacco and nicotine products in Finland by 2030. By monitoring smoking trends, health promotion can be honed to create change where it is needed most, which is a central aspect of the development of national cancer control plans, which hinge on cancer prevention. Registry data has been instrumental in revealing how smoking is a risk factor in a large number of cancers, not just the lung cancer with which it is usually linked. The value of cancer registries has been particularly impressive in the development of such work at international level. By strengthening cancer surveillance, and used in conjunction with a range of other epidemiological data, population-based cancer registry data is pivotal to the sources of knowledge used in designing the European Code Against Cancer. Increasingly, research communities are coming up with innovative ways to optimise the use of population-based cancer registries. In addition to mapping the matrix of cancer causes and risks, data is being used to evaluate the impact – both positive and negative – of treatment interventions. Better funding for registries could enable them to augment data collection to monitor the quality of care (e.g. Malin et al, 2002) and after care, the long-term effects of treatments, in developing registry work on cancer survivorship and survivor outreach, and in assessing socio-economic inequalities – and therefore health disparities – and the impact and attendant risk factors of “financial toxicity”. The hugely beneficial role of cancer registries has been particularly highlighted in a number of European actions. One such was the recent EUROCOURSE (EUROpe against Cancer: Optimisation of the Use of Registries for Scientific Excellence in research) programme, which in part sought to improve the work of cancer screening programmes with stronger interfaces with cancer registries. Europe has been at the forefront of cancer registry development. Registries have been developed since the early 1900s, and now cancer registration has become a key aspect of the European Union’s strategy against cancer, promoted within a number of initiatives, most recently the EU Cancer Control Joint Action (CANCON). In 2016 there were nearly 200 population based cancer registries in Europe, members of the European Network of Cancer Registries, and covering some 60% of the combined European population (Forsea, ecancermedicalscience 2016). Some 44% of these registries routinely evaluated mass screening programmes. In the developing world (low and middle income countries) cancer control desperately needs population-based cancer registries to be established and built up in order to drive policy. Some 70% of cancer mortality occurs in developing countries, meaning they carry the biggest cancer burden. But only about 5% of global resources for cancer prevention are spent in developing countries, and it is difficult or impossible to obtain quality data on cancer incidence and survival. The Global Initiative for Cancer Registration Development (GICR), a programme run under the WHO’s International Agency for Research on Cancer, aims to reverse this situation. In 2015, the IARC has set up six regional hubs in developing country regions to help with the development of cancer registries by providing expertise, training, and assess cancer registration needs. GICR intends to be active in 20 developing countries by 2020, increasing to 30 by 2025. Throughout the whole discussion of population-based cancer registries, the need for them and the variety of roles the do and can potentially have, one of the overriding concerns is qualitative: the quality of the data and work of registries. Cancer registries in essence are relatively straightforward systems, but they require robust quality assurance to make them viable and meet the basic characteristics we expect of them: comparability, validity, timeliness, and completeness (Sigurdardottir et al, Mar 2012). Staff competence and experience needs to be strong, combining expertise in oncology, computer data processing, and biostatistics. Registries need to cooperate effectively with a range of authorities and professionals, and there needs to be an active policy of improving data – requesting additional information and more accurate data. It’s also important to look beyond the immediate registry environment to monitor regional and other trends that might explain or anticipate changes in data and information received. Such quality needs to be sustained and augmented. It will better position cancer registries as key players in tech areas that in turn will feed back into their operations, embracing the whole sweep of new and upcoming developments in cancer control and care, from big data in healthcare to e-solutions in health promotion and monitoring.